Alphalite's LED RXL Retrofit Kit Strips series combines long life, controllability, and superior quality of light. 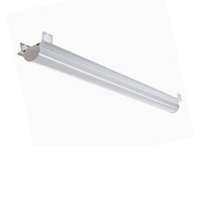 It was designed to be 4 feet long, 24 watts, and 2640 lumens for energy savings and easy maintenance. Alphalite's LED RXL Retrofit Kit Strips are suitable for various locations such as parking garages, hallways, and stairwells. This model is DLC certified and comes with a 5 year warranty.